This game with Spanish actions keeps kids laughing, moving and thinking. 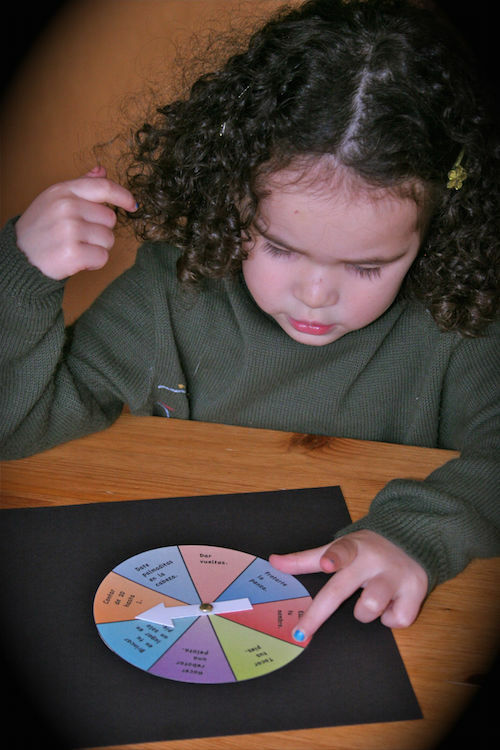 It is easy to make and play and can be adapted for different ages and vocabulary. The game uses a spinner (la ruleta) with Spanish actions. Spin twice and then try to do the two actions at the same time. Can you rub your belly and count backwards? Try to bounce a ball and spin around. It is silly and fun! You can adapt the actions for younger children and add harder ones for older kids. Include activities like Cepillarte los dientes or Comer una manzana to practice more vocabulary. 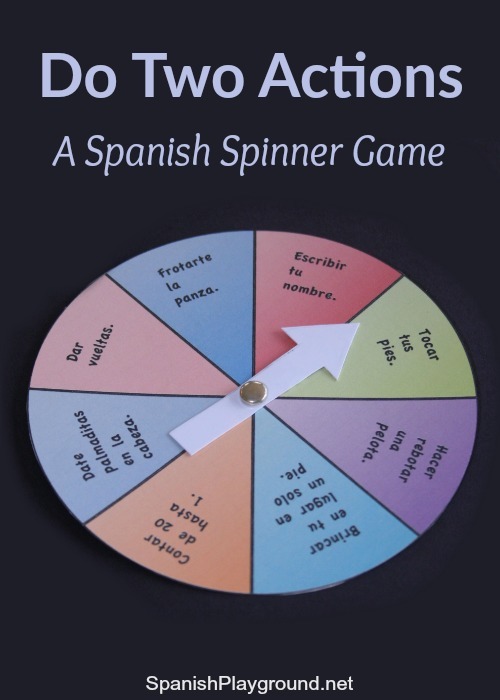 Below you will find a printable spinner with Spanish actions to get you started. Make your own with different instructions for more learning fun. You can also make dice with Spanish actions and play the same game. To get as much language as possible into this game, describe the actions as children do them: Estás tocando los pies. Ahora escribe tu nombre. ¡Lo hiciste! Describe what you are doing when it is your turn: Me estoy frotando la panza. También estoy dando vueltas. Te toca. – It’s your turn. Me toca. – It’s my turn. Dale vuelta a la ruleta. – Spin (the spinner). Frotarte la panza. – Rub your belly. Escribir tu nombre. – Write your name. Younger children can color. Tocar tus pies. – Touch your toes. Hacer rebotar una pelota. – Bounce a ball. Younger children can throw a ball. Brincar en tu lugar en un solo pie. – Hop on one foot. Younger children jump with both feet. Contar de 20 hasta 1. – Count backwards from 20 to 1. Younger children count up. Darte palmaditas en la cabeza. – Pat your head. Dar vueltas. – Spin around.